We are pleased to present below all posts archived in 'January 2011'. If you still can't find what you are looking for, try using the search box. 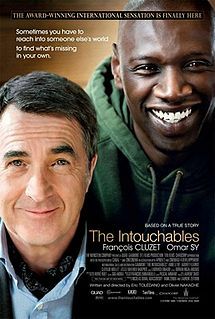 The Intouchables tells the story of a very wealthy quadriplegic named Philippe, wonderfully played by François Cluzet, who hires an unlikely live-in caregiver, a simple street guy with some criminal background, named Driss (superbly performed by Omar Sy). As the story develops, the two characters, who are as different as any two people can be, develop a very sincere friendship and end up inspiring each other while stealing the hearts of the film's audience. Set at the end of WWII, Four Days in May, a war drama directed by Achim von Borries to the work of Dmitry Faust, tells a story of high morals, involving a price of life and death. If one puts aside the politics and the shaken credibility of the story, Four Days in May is a touching human drama. The film suffers from some pacing issues and feels, at times, as a showcase for acting. But it does have an interesting core story and enough tension to make for an engaging film. What’s Wrong With the World? and What Can We Do About It? The resulting documentary combines Shadyac’s personal story with interviews with scientists, religious leaders, environmentalists and philosophers. Much like Cinema Paradiso and The Artist, Hugo is a love story for the art of filmmaking. It is also a tribute for the earlier days of movie magic, highlighting the works of Georges Méliès. All in all, the plot doesn’t hold the weight of the topic at hand, and the switching between laughs to tears with an occasional musical beat are just awkward. Still, kudos for the attempt. All in all Haywire doesn’t deliver the goods. It is another one of Soderbergh’s misses, a smart director whose work I find highly uneven.